On Saturday morning in Ann Arbor, Michigan, it was about 30 degrees outside, but I was in my backyard enjoying a 75-degree day at the beach. That’s only possible because I was testing out the first attempt at streaming virtual reality from one place to another — in this case from Laguna Beach, California, to a Samsung Gear VR headset strapped to my head. Thanks to technology from the folks at Next VR, I could see and hear everything in 3D as though I was actually there, looking around in a virtual reality environment while on the phone with co-founder David Cole. Next VR’s demo reel takes viewers to a prerecorded NBA game, beach scene or Coldplay concert, but until now, no one outside of its labs has actually used the technology to visit another place via a live feed. A couple of years ago, we talked to the company about its plans to distribute live video in a virtual reality environment and today that dream came true. 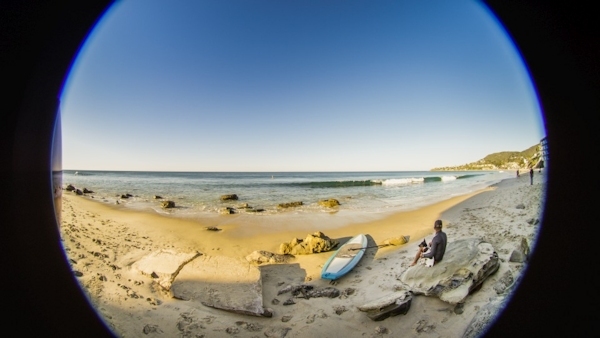 For our test, Next VR set up one of its 180-degree cameras along the beach displaying the scene (seen above) that I could experience over an 8 Mbps stream. According to Cole, its broadcast could send the 6K resolution, 80-frame-per-second stream because of the technology it’s worked on that only sends the portion where I was looking. While this weekend filmmakers demonstrated what they can do with VR, his company is ready to deliver on its promise of live video that makes viewers more than a spectator of live events — it can take them there. The Galaxy Note 4 inside Samsung’s headset reconstructed the video and 3D geometry in real time fast enough that I didn’t experience any lag or motion sickness looking around. Next VR says its tech can work at bitrates as low as 4 Mbps, which could be possible when it’s connected to a CDN. As it was, there was still the occasional hitch in the frame, but that wasn’t enough to send me back to the reality of Michigan’s near-freezing temperatures. I don’t know what John Carmack, Mark Zuckerberg or Palmer Luckey have in mind for the future of VR, but after what I experienced I’m ready for a virtual reality feed from every major event — NBA All-Star Game, Super Bowl, State of the Union address, whatever. It’s not quite teleportation, but having seen 4K, 8K and everything else, the sense of “being there” has never matched what even this heavily compressed stream on a phone and $200 headset could provide. My second session was a peek at the sun setting over the beach. Take a look at it through the VR camera’s lens below and tell me you wouldn’t want to visit, even if the only travel taking place is in your head.